The Giant Schnauzer is a large, powerful, compact dog. It looks like a larger version of the Standard Schnauzer. The dog’s height is the same as the length, giving it a square look. The head is strong and rectangular in appearance. The muzzle is the same length as the top of the head. The stop is slight. The large nose is black. The lips are black and do not overlap. The teeth meet in a scissors bite. The oval eyes are medium-sized, deep-set and dark. The ears are set high on the head and are either cropped or kept natural. When cropped they stand erect with a pointed tip. When left natural the ears are V-shaped, carried close to the head. The back is straight. The front legs are straight when viewed from all sides. The tail is set high and is usually docked to the second or third joint. Note: docking tails and cropping ears is illegal in most parts of Europe. Dewclaws are almost always removed from the back legs, and may be removed from the front if they are present. The double coat has a wiry, dense hard, outer coat with a soft undercoat. The hair stands slightly up off the back, with coarser, longer, bushy whiskers, beard and eyebrows. Coat colors come in solid black and salt and pepper. 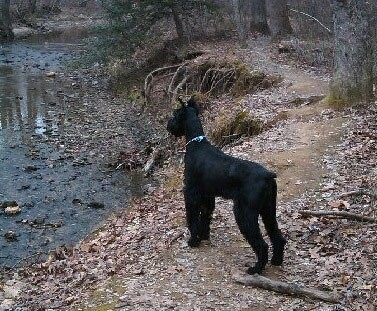 The Giant Schnauzer is an intelligent, versatile working dog that will be calm with enough exercise. Reliable, brave, loyal, bold and vigorous, it loves to be with its owner at all times. It is easy to train, responding best to firm, calm consistency with a positive attitude, rewarding good behavior. 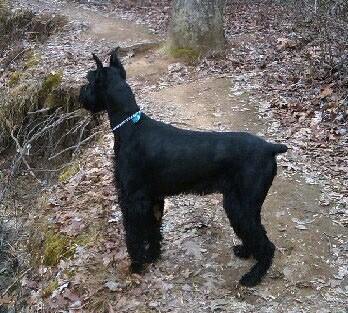 If the Giant Schnauzer is properly trained and well exercised with a firm owner, it makes a very good pet. The objective in training this dog is to achieve pack leader status. It is a natural instinct for a dog to have an order in its pack. When we humans live with dogs, we become their pack. The entire pack cooperates under a single leader. Lines are clearly defined and rules are set. You and all other humans MUST be higher up in the order than the dog. That is the only way your relationship can be a success. 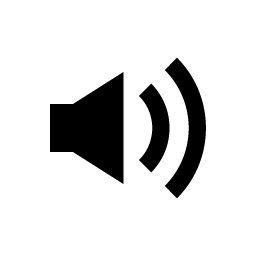 Giant Schnauzers tend to be on the dominant side and need an owner who understands canine behaviors and knows how to display authority, in a calm, but stern, confident manner and be consistent about it. Without it they may become overprotective and serious, with a hard-headed temperament, as they believe they are alpha to humans. Socialize well around many different people to avoid them becoming suspicious of everyone they are not familiar with. Through absolute consistency you need to show them you mean what you say. They are tremendous guards and their large size alone is a deterrent to trouble. Giants that know their place is below humans, are well socialized, and that receive enough daily mental and physical exercise will usually love everyone; sweet-natured goofballs. One owner says, "Our Molly is actually a therapy dog at Toronto's Hospital for Sick Children, but would still protect our home till the death if pushed. Our family is very active, either hubby or I do two trail runs a day with our crew and this tires them out and is also lots of fun for both them and us." Some of the great qualities of Giants are that they can excel at obedience, agility, carting and protection work. If properly trained they are dogs that can do it all. They need an owner who displays consistent leadership, or they will feel it is their job to take over as top dog, causing them to become dominant with other dogs. If not given the proper amount of exercise and left to their own devices, this breed can turn very destructive, if their energy and busy minds are not channeled properly. Since they are one of the very few large breeds with a non-shed coat, they are attractive, but if not with an owner who knows how to display consistent leadership, they are often given up before the dog reaches age two. They can be fairly reserved with strangers and should be socialized extensively both with other dogs and people, preferably starting when the dog is a young puppy. They are usually good with other pets. Giants have been bred for generations as guard and watch dogs. They are huge and have a relentless, imposing bark when they hear, see or perceive anything out of the ordinary. Giants are more prone to cancer than most breeds, especially toe cancer which kills many Giants annually even if caught early. They are at increased risk of bloat. Epilepsy is all too common in this breed and hip dysplasia is rampant. Giants have a huge need for exercise and if not vigorously done at least twice daily they bounce off the walls and be difficult to deal with, even a very well trained one; they have to expend the excess energy they were originally bred for or they just can't settle at night. They need to be taken on a daily, brisk, long walk, jog or run alongside you when you bicycle, at least once a day combined with an additional walk or another type of exercise. These energetic dogs will take as much exercise as they can get, and just love play sessions during which they can run free. If you get a Giant, plan on daily long walks, running, hiking, biking, swimming, or to get involved in agility (obstacle course), advanced obedience, Schutzhund (protection), carting, tracking, or a similar canine activity. If you do not have time to devote to any of these, this is not the breed for you. The wiry coat is reasonably easy to look after, but the undercoat is dense and it will become matted unless it is combed or brushed weekly with a short wire brush. Clip out knots and brush first with the grain, then against the grain to lift the coat. The animal should be clipped all over to an even length at least four times a year and ear care continually is important. A person can easily learn how to do it themselves. Pet dogs are generally clipped, and show dogs are usually hand-stripped, which is the process of hand plucking the outer guard hairs either with your fingers or a stripping knife. Trim around the eyes and ears with a blunt-nosed scissor and clean the whiskers after meals. They have no doggie odor and shed little to no hair. 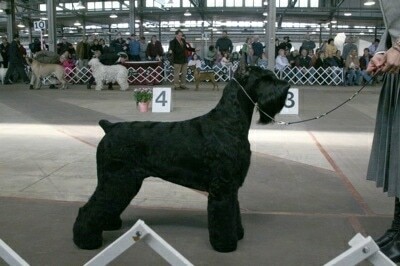 The Giant Schnauzer originated in the Wurttenberg and Bavaria sections of Germany. During the years around the turn of the century, both smooth German Pinscher and coarse-haired Schnauzer pups appeared in the same litters. The German Pinscher Schnauzer Club initiated a policy requiring proof of three generations of pure coarse-haired Schnauzer coats for registration. This quickly helped set type and made them a distinct breed from the German Pinscher. These Schnauzers were given the name Standard Schnauzer. 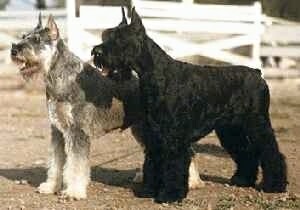 These Standard Schnauzers were crossed with the black Great Dane and the Bouvier des Flandres to form the Giant Schnauzer breed. The Schnauzer name derived from the German word "Schnauze," which means "muzzle." 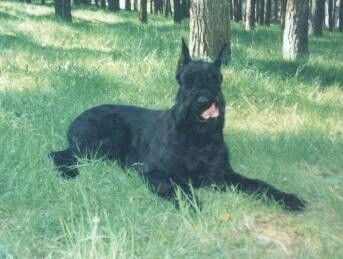 The Giant Schnauzer is called the “Riesenschnauzer” in Germany, which means "the giant." The Giant Schnauzer was used as a cattle driving dog in Bavaria, and as a guard dog by the police and military and excels at Schutzhund. 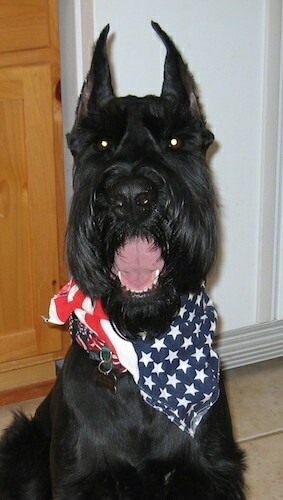 Charlie the black Giant Schnauzer at 2 1/2 years old wearing an American Flag bandana—"This is Charlie, my 2 and a half year old Giant Schnauzer. Charlie is a wonderful dog that is full of life and loves to play. Charlie can be quite the goofball. He is my beautiful boy, with not a mean bone in his body! All he wants to do is play and have a good time. Like a typical Giant, he can be quite stubborn at times. I enjoy photographing Charlie and love every minute I can spend with him." 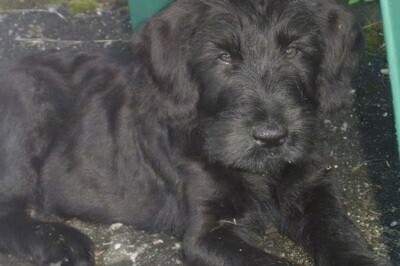 Mater the Giant Schnauzer puppy at 8 weeks old—"To better understand my dog, you almost have to be around my son! They are two peas in a pod! My son is 5, and Mater is a year and a half. 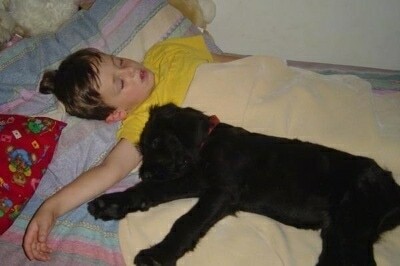 I got Mater when he was 8 weeks old. His ears were never clipped, so it seems to add to his goofy personality. Like the breed description states, he is protective and gives off a thunderous bark at strangers and noises he is not familiar with. He is well socialized and loves all dogs, big and small. He is not dominant around any dog breed that he has been exposed to, but he will however try and dominate a small child if they act scared of him—so I need to step in and show him that he is the dog, and they are the human and he can trust them. He gets along best with kids 4 years or older because then they are old enough to throw him a ball and run with him. His exercise takes place at a school playground/park behind our duplex and the usual group of 8-12 kids play with him and he loves it. He is not aggressive, but protective." 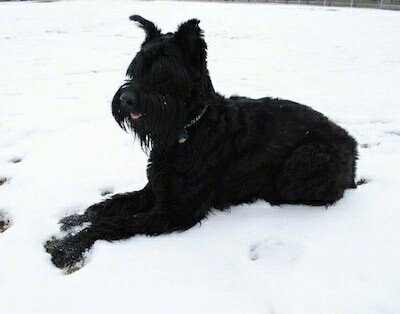 Jada the Giant Schnauzer at 7 years old—"Jada has proven to be very alert, extremely protective, and intensely loyal; as a true "Velcro" dog, they love their people. Expect a high-energy dog. It took about 6 years for her to master the "on-off" energy switch. Routine exercise is a must for a calm and sociable Giant, as well as firm and consistent training. They have a heavy terrier influence, and at this size, it's very important to be able to read your dog."